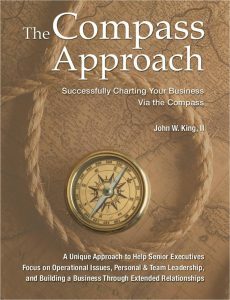 The Compass Approach is based on a book authored by John King, “The Compass Approach – Successfully Charting Your Business By the Compass“. West – Customers, Suppliers and Your Brand – recognizing the need for key customers and suppliers to understand your strategic direction and how they need to support it. Also a discussion on creating an innovation environment to avoid disruptive business events that can impact your bottom line. Center – Improved Results – covering the impact of following the four points of the compass to help you understand where you are and where you want to go to achieve your desired results. The Compass Approach provides you a method to a navigate the triumphs and pitfalls of successful personal and team leadership to help build profitable extended relationships. Download a more detailed PDF description here. Hard Copy – Request through the button at the bottom of the page – Priced at $19.95 US shipping included for US Addresses. Contact us to arrange for a hard copy of The Compass Approach at a discounted price of $12.95 US shipping included for US Addresses! The Compass Tune Up – an assessment offering where we help identify areas where you can achieve improved businesses results based on the concepts presented in The Compass Approach. This assessment can be followed up with a personal coaching sessions as appropriate with the management team. Contact us to arrange for a discussion with John King on how The Compass Tune Up can help your business!